Anyone I edit for will have heard me wittering on about a book called the Emotion Thesaurus (and if you haven’t you will – trust me on that). In my opinion this book is a must have for any writer of fiction. Once upon a time my characters went a little overboard with all their nodding, smirking, shrugging and whispering (like every few pages overboard, sometimes more). Actually, I went on to buy both the Positive trait thesaurus and Negative traits thesaurus by Angela Ackerman and Becca Puglisi, but these books are not the point of this post. 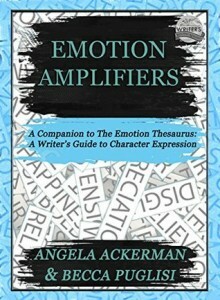 There is another book out – Emotion Amplifiers – a companion to the Emotion Thesaurus, and best of all, it is free (at the time of writing).